The kitchen was on fire at the Unilever Food Solutions Chef of the Year finals, held at the Umhlanga offices on 6 September 2017 as chefs from across the country competed head-to-head in a bid to add the coveted title to their resume, kickstart their careers and win the recognition of their peers. The results of this year’s competition clearly highlight South Africa’s ability to compete as a global culinary tourist destination. 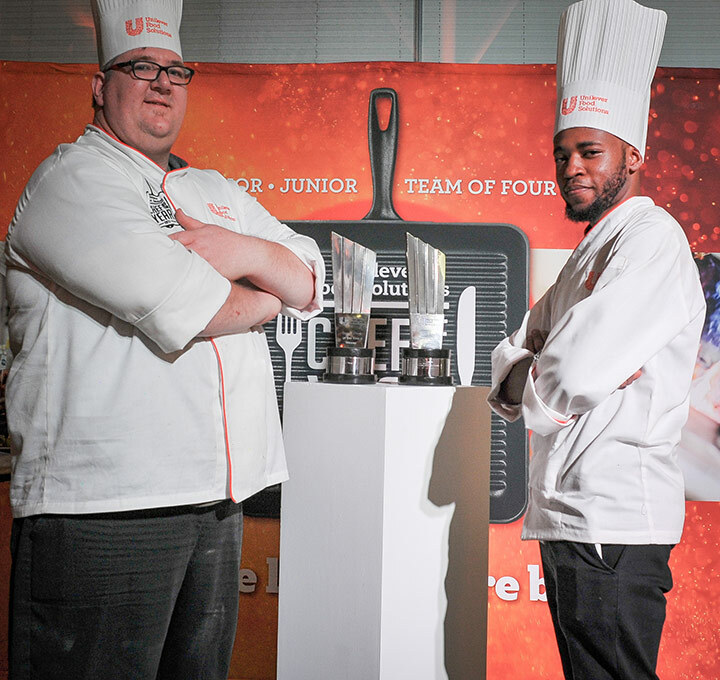 Held in three categories – Senior, Junior, and Team of 4 – the Unilever Food Solutions Chef of the Year is the oldest culinary competition in South Africa, with a 40-year heritage of providing the industry with a platform for the recognition of culinary talent. The top six chefs in each category are selected based on regional cook-offs in the Senior and Junior categories, while the top six teams are selected based on competition entries. The winner in the Senior category was Jean-Pierre de la Motte of the Lord Charles Hotel in Cape Town who presented three consistently noteworthy dishes, namely seafood croquette, tomato and red pepper chutney with salmon ceviche and smoked garlic aioli, followed by slow-braised duck with roast cauliflower purée, seasonal veg and crispy duck skin, and tiramisu mousse with chocolate sponge and almond nougatine. In the Junior category, the talent and potential of the Saxon Hotel’s Terror Lekopa garnered much attention from the judges (read more about Terror Lekopa here), who were impressed with his starter of pan fried kingklip, tomato mayonnaise, carrot purée, pickled radishes, tomato sponge and lemon and herb cream, which was presented alongside seared ostrich, parmesan croquette, cauliflower purée, roasted beetroot and red wine demi-glace, and baked cheesecake, lemon sorbet, orange curd and passion fruit jelly. Willem van der Merwe and his team from the 12 Apostles won in the Team of 4 category. Their impeccable cooking, presentation and service skills proved to be a recipe for success at this year’s competition. The Team of 4 category was created to recognise the efforts of hard-working and skilled members of the kitchen support team, who are often not given credit for the roles they play in quality hospitality experiences. Top chefs and teams in the three categories took home a collective total of R110 000 in prize money, with an added bonus for the top Junior Chef of the Year – a trip to Nice on the Côte d’Azur in France, to apprentice with Chef Jan Hendrik in his Michelin-star restaurant – in addition to a R10 000 cash prize. Pictured left to right: Jean-Pierre de la Motte of the Lord Charles Hotel in Cape Town and Terror Lekopa of Saxon Hotel in Johannesburg.